This super easy Honey Roast Chicken with Spring Peas is one of the best chicken recipes I’ve ever had! I bet you’ll think so, too. The skin is golden, crunchy, chewy, sweet, and salty, crispy deliciousness. The meat juicy and flavorful, and the spring peas? Just the right touch. The resulting sauce? Heaven! If you’re not into a whole bird, there are directions to cook chicken pieces, too. I can’t take credit for this Honey Roast Chicken with Spring Peas, but I simply had to pass on this super easy recipe of Lia Huber’s published in the April 2012 issue of Better Homes and Gardens. I will take credit for being smart enough to try it, even though I’m not normally inspired by honey. And for fabulously frugalizing the recipe. It is my new favorite, bumping Sunday Roast Chicken to number two status. I pulled bargain chicken out of my freezer and made a few changes in ingredients and amounts that brought Honey Roast Chicken down in price to fit my budget! Sorry, folks, no Champagne in my recipe! I do have a marvelous substitution, though. I served it with the peas from the recipe, mashed potatoes, and my favorite Glazed Carrots. The Honey Roast Chicken with Spring Peas came at well under seven dollars for the whole meal but there’s a bonus. I’ll use the carcass & bit of leftover chicken for my Best Turkey or Chicken Broth and stretch it for another meal. Preheat oven to 375 degrees. Pat chicken dry and truss or skewer neck skin to back, tie legs together. Place in shallow roasting pan (one that can go on the burners to make the sauce) and sprinkle with salt and pepper. Roast uncovered, for 1 1/4 to 1 3/4 hours – open door and brush with butter after about 10 minutes. As soon as drumsticks move easily and chicken is no longer pink (165 degrees in the thickest part of the thigh) brush with honey and sprinkle with half the tarragon. Roast five minutes longer or until honey forms a golden brown glaze. Watch your pan drippings during cooking – if they look in danger of drying out and burning add a little water or stock. Add frozen peas and lemon and heat through, three to five minutes. Taste, and adjust salt and pepper, and vinegar if using. Plate chicken on a platter surrounded by peas, garnished with lemon, if desired. Brush with additional honey if you’d like. Note: If I serve this with mashed potatoes I strain the peas and pass the sauce; my family prefers the peas on the side. Use a coupon matching site!Every store has a group of enthusiastic Coupon Matchers. Do not discount the savings! You serve this with another vegetable besides peas, especially as the seasons vary. The sauce is very thin, even after a bit of reduction, but you could easily thicken it with about a teaspoon of cornstarch dissolved in a bit of water – just bring it to a good simmer. If you’d like to use parts rather than a whole chicken, arrange skin side up in a shallow baking pan. Brush with butter, then sprinkle with salt and pepper. Roast, uncovered for 35 minutes. Brush with honey, sprinkle with tarragon. Roast five minutes longer until honey forms a golden brown glaze. Continue as directed for sauce. 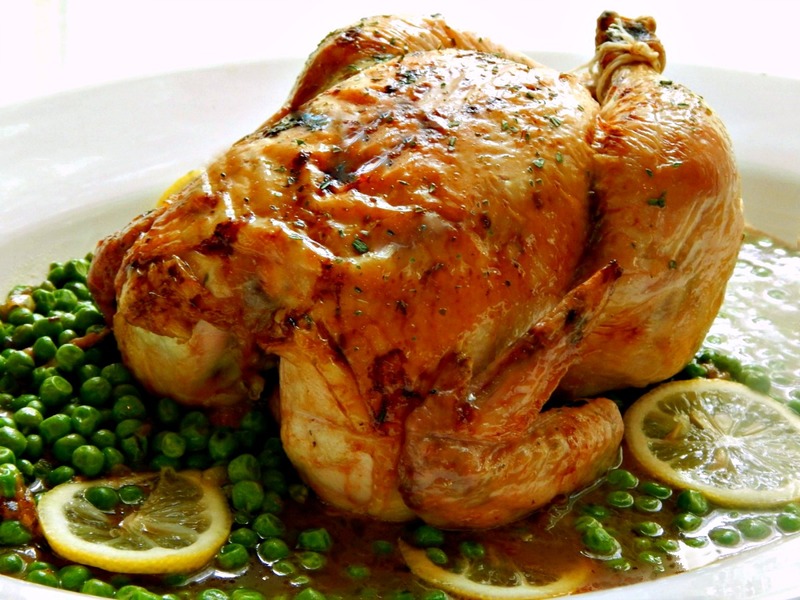 Honey Roast Chicken Recipe made April 2012 for $5.72; remade in April 2015 and priced at 71 cents more. Cost $6.43. This entry was posted in Click here for Bargain Meals, Click here for Fabulous Food Posts and tagged Bargain Meal of the Week, Better Homes & Gardens, Chicken, Easy Recipe, Frugal Hausfrau, Peas, Roast Chicken, Vegetable Side, Wine. Bookmark the permalink.